Creating a website for your restaurant? WordPress provides the best solutions for this. But finding a suitable WordPress theme from all the unlimited options available on the internet is a rather difficult task. 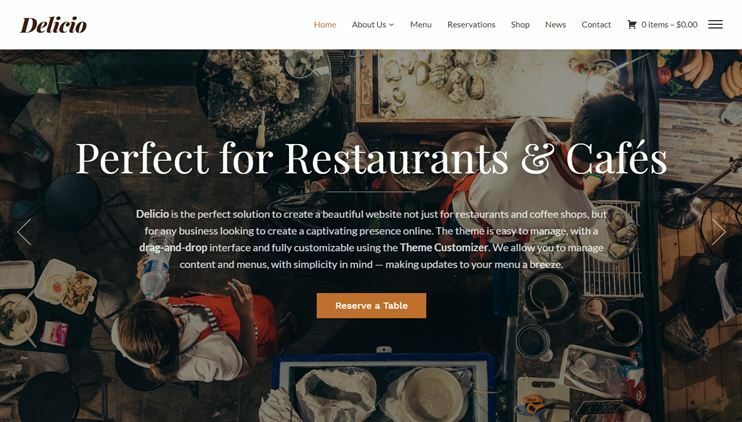 So, we have listed out some of the best WordPress Restaurant Themes of 2019 that you can use for your restaurant’s website. With these themes, you can create a website with easiest and most intuitive options. 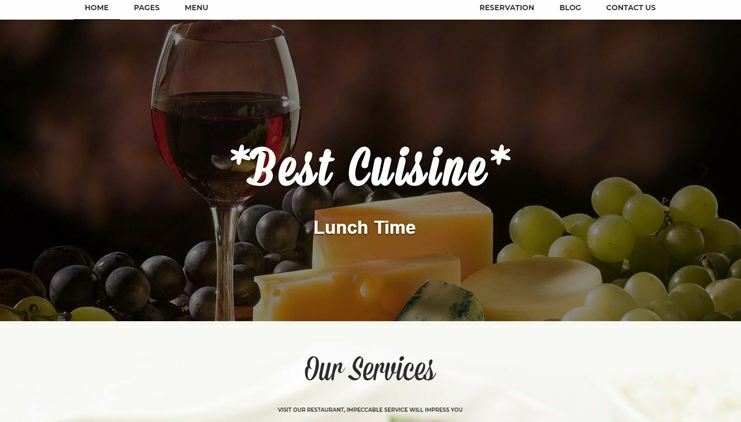 From this list, you can find the theme that lets you create a comprehensive WordPress restaurant website with an e-shop and table booking facility. At the same time, it also includes simpler themes for creating an official website for your restaurant that displays services and features of your restaurant. All these themes are highly customizable and flexibility. You don’t have to worry about the branding. And most importantly, you don’t require any coding knowledge to use this theme. They have the options to change the theme and personalize it with very easy and intuitive options. So, check out these themes now! Alternately, you can also have a look at this directory software you can use to create location-based restaurant directory websites easily. Create a complete modern restaurant website with a functional booking & reservation system. 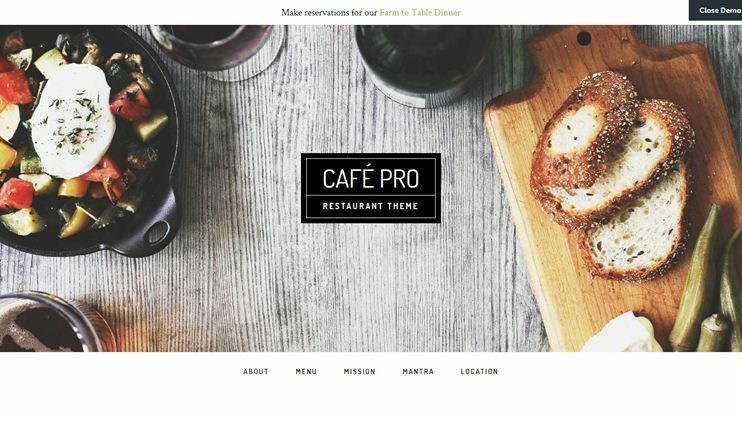 This WordPress Restaurant theme is ideal for restaurenters, small hotel & pub owners and other food business entrepreneurs to create their website on their own. 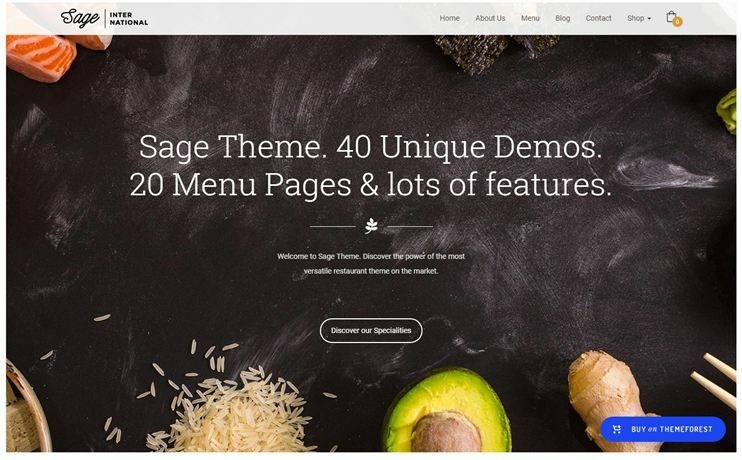 Sage is a premium WordPress food blog themes 2018. The theme can be used for a bar, restaurant or any kind of food related website. With Sage you get the Visual composer drag and drop page builder. The theme lets you choose from over 40 demos, all dedicated to different kind of cuisine. With the theme you get pre designed menu pages to use for your restaurant. You can integrate WooCommerce for ecommerce features in your website. With this theme you can create a one page or a multi-page website. The theme supports video backgrounds and is speed optimized. To style your website, you have unlimited color options, fonts and icons. Sage is an SEO optimized theme. 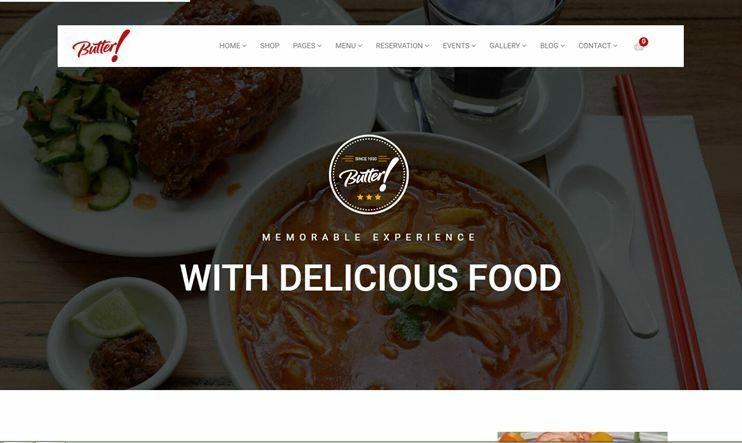 Resca is a multipurpose cuisine related theme that can be used to create a website for restaurants, hotels, food points, etc. It is a performance optimized theme with advanced features and unlimited customization options. There are a few demos you can choose from. Resca can be used to create a one page or multi page website. It comes with a drag and drop layout builder to let you create layouts of your choice. It offers the table reservation feature using the OpenTable reservation system. It allows you to create menus with images. The theme is SEO optimized and RTL ready. It offers compatibility for WooCommerce for ecommerce features in the website. You can create beautiful restaurant website with this theme in 2018, by the easiest means. If you are a newbie to WordPress, this theme is highly recommended. 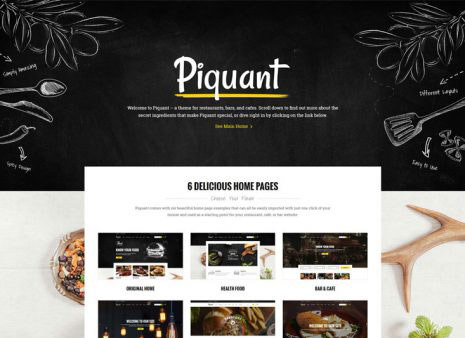 Piquant is one of the restaurant and cafe themes that you can use for your website in 2018. The theme can be used to create any website related to the eatery business. Piquant lets you choose from the available homepage layouts. The theme has a stylish blog to let you display the recipes. For allowing reservations on your website, the theme is compatible with OpenTable. The theme also supports WooCommerce. Visual composer will let you create pages for your website. Piquant is SEO ready and supports a child theme. 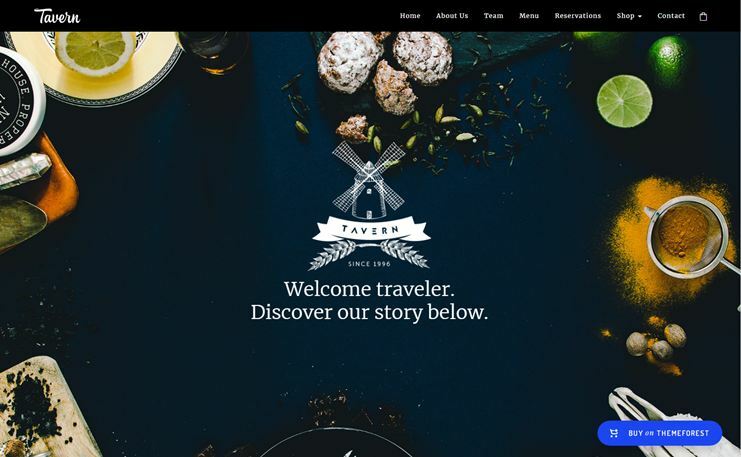 Tavern is one of the multipurpose WordPress restaurant themes. It has a stylish design and plenty of features to create a full-fledged restaurant website. You can use Tavern for creating a multipage or single page website. The theme allows the reservation facility using the OpenTable plugin. It comes with a beautiful pre designed menu page. With the Visual Composer and more than 60 page building elements you can create pages of your choice. The theme has elegant parallax scrolling support. For ecommerce features, you can integrate the WooCommerce plugin. The Redux framework based admin panel will allow you to manage the website with easy options. The theme allows you to use the Google fonts and Font Awesome icons. It is SEO optimized. Grand Restaurant is one of the best restaurant and cafe themes. It allows you to choose from the 6 available demos. However, you can create any sort of cuisine and food related website using the Grand restaurant. You can customize your website with the live customizer. The inbuilt content builder will let you create your website content easily. The theme comes with maps integrated. It also has beautiful parallax sections. If you wish to create a one page parallax website with the theme, that too is possible. For ecommerce and online shop features, you can integrate the WooCommerce plugin. Grand Restaurant has beautiful gallery options. It is SEO optimized. 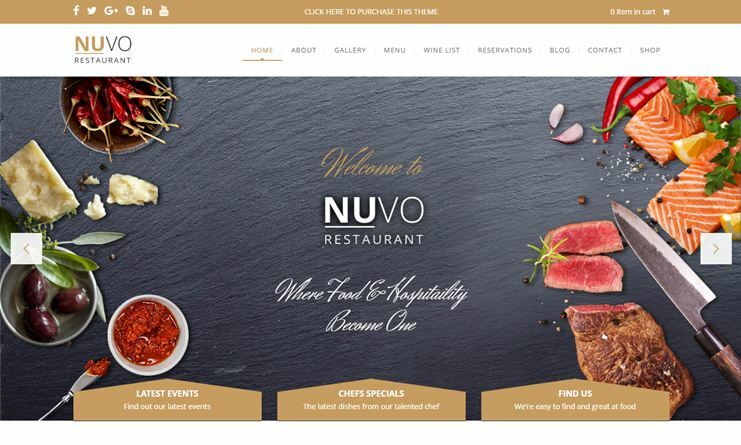 Nuvo is a perfect theme for restaurant, bristo, cafe, etc. It can be used to create a website related to the food industry. The theme lets you choose from the multiple demos. It allows smooth parallax scrolling. The parallax sections can have image or video as the background. With Nuvo you can easily create menus using the menu builder. The theme comes with an inbuilt reservation management system. With nuvo you can even add events on your website and show events countdown. You can use the WooCommerce plugin for ecommerce features in your website. Create the desired pages with the Visual composer drag and drop page builder. The theme also comes with essential grid included. 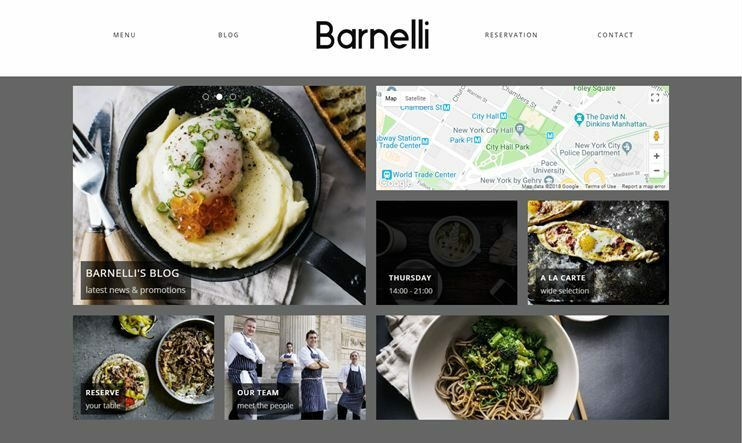 Barnelli is a responsive restaurant WordPress theme. It is a simple yet elegant WordPress theme to create a website for your restaurant. The position of the logo can be changed. With WooCommerce you can integrate the ecommerce features into the website. The homepage of Barnelli is highly customizable so you can make it look the way you want. It comes with google maps integrated and allows custom map markers. With this theme, you have unlimited customization options. And all the customization is possible with very intuitive and easy options. 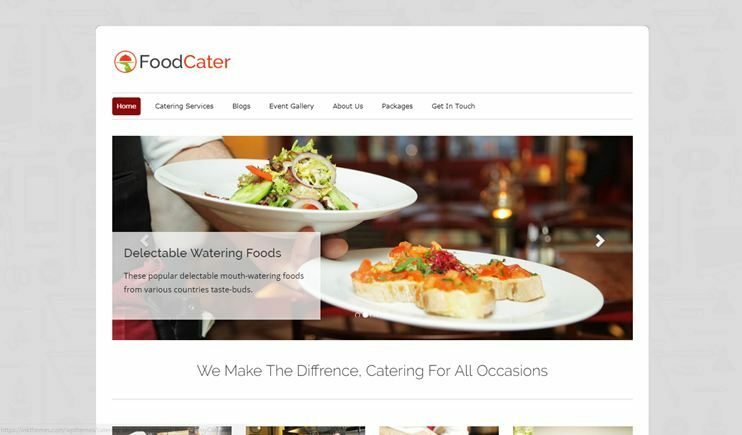 FootCater finest food catering service provider WordPress theme is unbeatable for Food Caterers, Restaurants, Cafe’s, Wedding Planners and all type of Party Organizers, Event Managers & Coordinators. The commercial theme with stylish and professional design with a responsive layout looks fab on all devices. The theme comes with divergent inbuilt page templates and ample functionality features such as home page slider, Four Column Feature Area, Widgetized Footer, Powerful Admin Panel, Cross-browser Compatible and Business Tagline Section etc. Allow your customers instantly connect with you by a lead capture form on homepage, collect and convert leads through form, all the mail id’s will be automatically get stored in form of list to your backend that will help you to send back emails later. 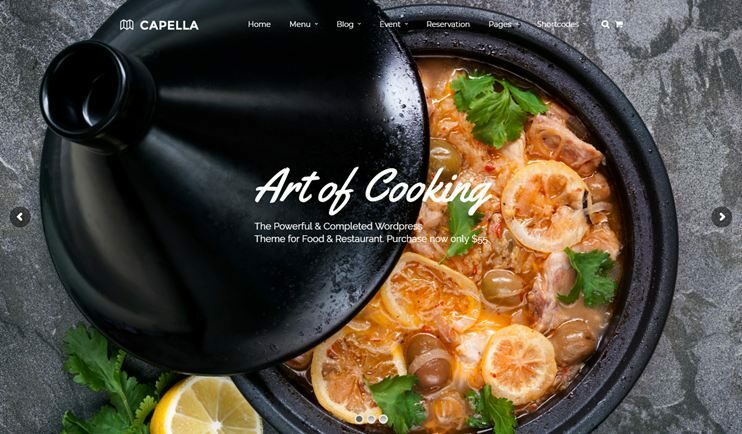 Capella is one of the best parallax cafe and restaurant themes. It can be used for pubs and restaurants. The theme has flexible options and you can create almost any sort of eatery related website using the theme. Capella has a remarkable parallax smooth scrolling interface. To create content of the website, you can use the drag and drop content builder. You can display your food images using the gallery options. The menus of your restaurant can be displayed with a modern format. The Capella theme comes with a working reservation request form. The theme lets you create and manage events. 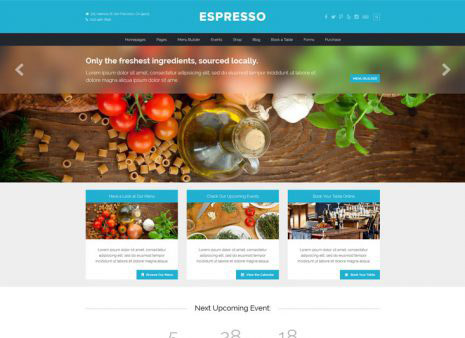 Espresso is a WordPress restaurant theme. It comes with unlimited customization options and flexibility to let you create anything out of it. The theme comes with in bundled Visual Composer for creating pages of the website. It has compatibility for WooCommerce as well as Events calendar. So, you can include ecommerce features and events in the website. To display your delicious food, you can use the Envira gallery. This theme includes a menu builder to let you create attractive menus for your restaurant. The theme is highly customizable and very easy to use. Sushi is a food WordPress theme. With this theme you can create a comprehensive restaurant website of any such food industry related website. 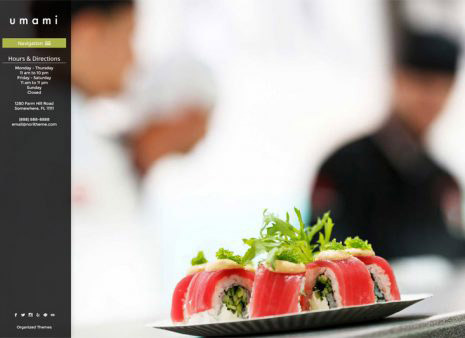 Sushi allows you to choose the header for your website. You also have beautiful designs for presenting your food menu. For ecommerce features, you can integrate the WooCommerce plugin. The theme comes with Events calendar integrated for events on the website. The theme also supports mailChimp. The admin panel - i.e Buddha panel of the theme allows you to manage the website with easy options. For styling your website, you also have a lots of shortcodes and 3 skins to choose from. 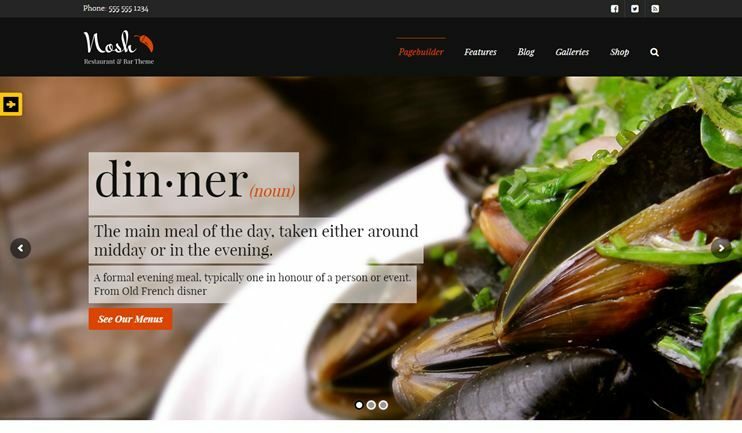 Nosh is a theme for creating a website for restaurant or bar. It has all the features required for creating such website. Everything in the theme can be managed with easy and simple options. With the easy admin options, you can customize the theme as per your desire. You can create pages with the page builder. To display your images you can use the beautiful galleries. With the post type items, you can easily add the food items you want to display on the menu. The theme supports bbPress, BuddyPress and Events Calendar. It is SEO optimized. 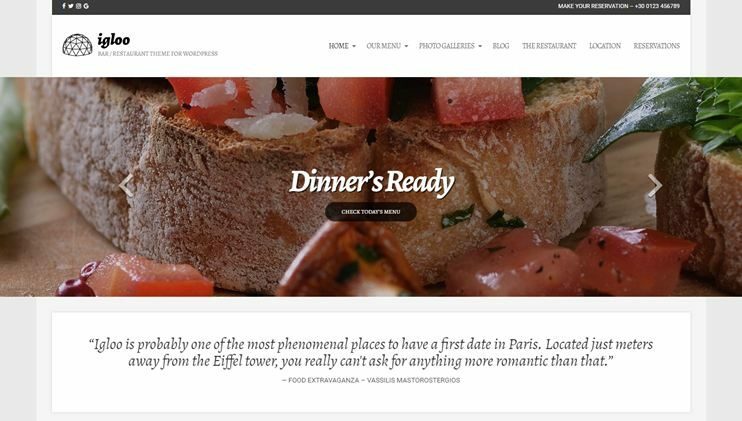 If you run a restaurant and you need a top-notch website to show off your business, WoodPecker is a marvelously designed accomplished WordPress Theme. The theme has appealing and unique features that will complement your business. 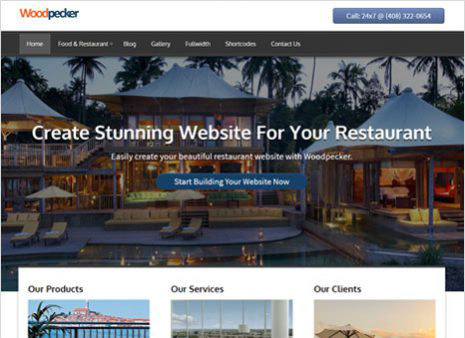 WoodPecker is equipped with demanding elements that strengthen your business site. All key elements present in theme adds a meaning like, a movable full width slider on the homepage to exhibit ambience/beauty of your restaurant, 3 column feature area to describe your ravishing services, two video box to add videos on the homepage and more.All the features of the theme are distinctly defined which gives a convincing look to your site. Moreover, there is a separate section given in the theme options panel where you can mention an effective heading about your business with some punchlines. Kataleya is one of the WordPress themes for pizza, coffee, restaurant, hotels, pub or bar. There are unlimited possibilities of what you can do with it. This theme allows you to choose from the 5 available demos. It comes with working food ordering system. You can display your food items with the menu options. With Kataleya you can even allow table reservation system for your website. Choose from the available color schemes for your website. The theme allows you to create unlimited pages with the Visual Composer page builder. It also has amazing blog styles. The code of this theme is clean. 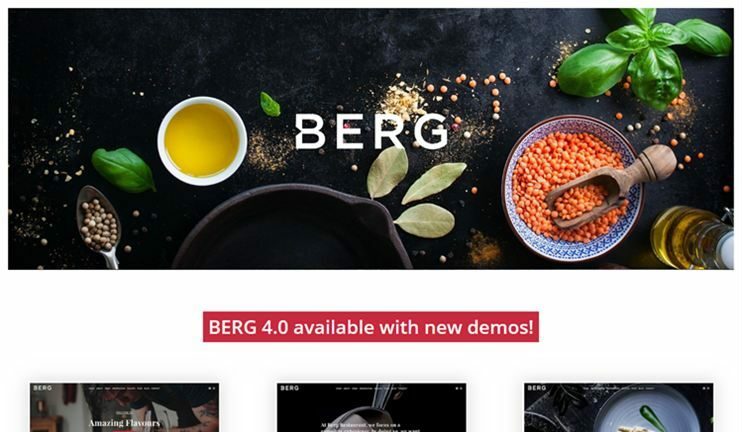 Berg is one of the very feature rich WordPress restaurant themes. It has all the key features that are required for creating a restaurant website. The theme comes with Visual Composer included for drag and drop homepage creation. For reservation facilities the theme supports OpenTable. For ecommerce features you can integrate the WooCommerce plugin. The theme has a flawless navigation system for easy navigation through the website. The theme is well planned and elegant. 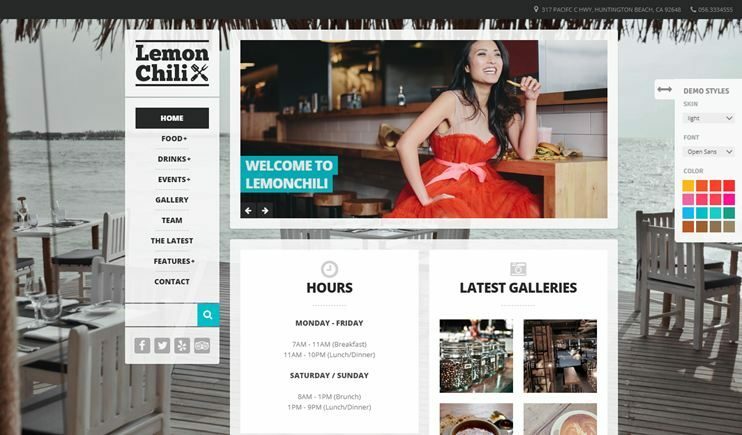 Lemonchilli is a theme for restaurant, bar, clubs, hotels or any other food point. It is highly customizable and includes all the required features within itself. It allows to customize the website by setting your own color, fonts and skin. With the advanced theme options, you can change the settings for your website. The theme allows you to display events and has widget for upcoming event. With custom post type you can introduce your team members and also display unlimited images using the gallery options. LemonChilli is SEO optimized. Milano is a portfolio website template for hotel and restaurants. The theme can also be used for photography and any other portfolio options. The theme lets you display your cooking skills using the carousel portfolio. The theme comes with abundant customization options to let you make the theme look the way you want. The theme also comes with sound option to play background music. The theme also supports vimeo background. You have advanced slideshow options. You can set custom background for each post. 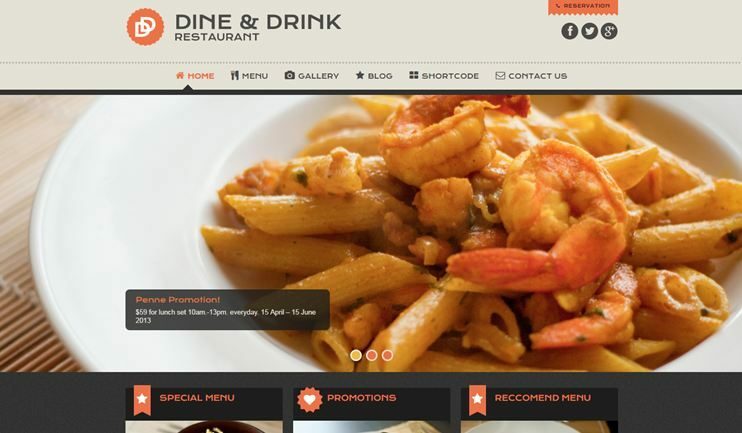 Dine & Drink is one of the best restaurant WordPress themes. The theme lets you choose from the demos for pasta, bakery, Dinning, cafe or salad. To create food menu for your restaurant you can choose from the one of the 3 available menu styles. Dine and drink is highly customizable. You can make the theme look unique using different color, font, background and icon combinations. With this theme you have admin options to change the website's settings. You have unlimited customization options and useful shortcodes. The theme is SEO optimized. 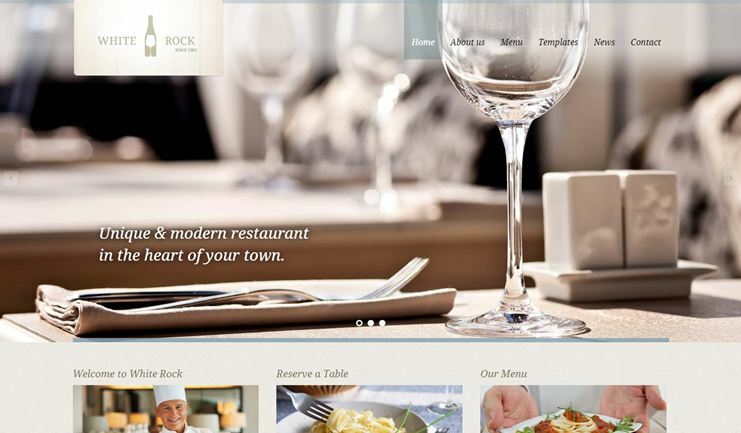 White Rock is a highly customizable and feature rich WordPress restaurant theme. 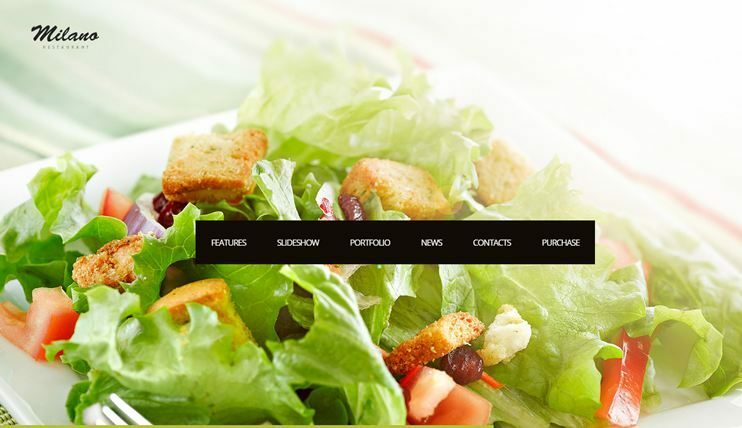 You can use this theme to create a website of any kind of food and dining related business. You can set colors using the front end color picker tool. The theme allows you to create menus on your website very easily. You can create unlimited sidebar for your theme. It also has some utility based custom menus. The theme has flickr and twitter widget designed to fetch the flickr photos and twitter feeds. Any kind of customization in the theme can be done with utmost ease. 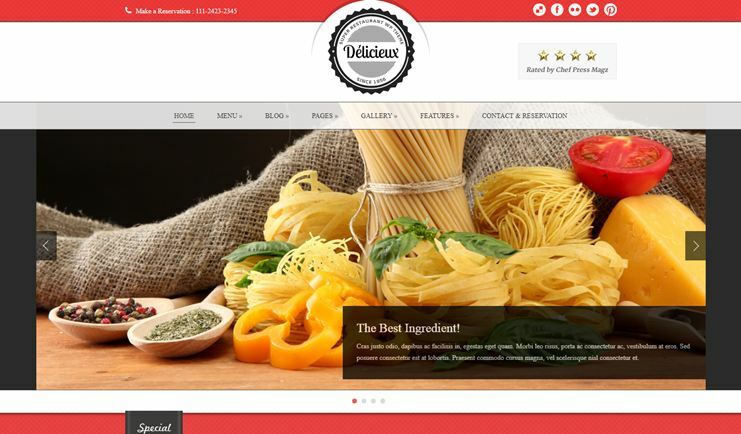 Delicieux is a simple yet feature packed restaurant WordPress theme. It lets you create the website of your dream with easy options and customizable features. Create content with the drag and drop page builder. The slider manager will allow you to set the slider with drag and drop options. Create the menu card for your restaurant very easily. The theme allows you to upload fonts and background and use them in your website. You can showcase the food with the inbuilt option. It allows to show the pricing with the pricing table. The theme comes social share options for the post. The theme is SEO optimized. Restaurant theme from Organic themes is designed for restaurants, food points, chefs, cafes, etc. It can also be used as one of the food blog themes. With the dedicated post type for food menu, you can create online menus. To let you sell products online, Restaurant theme is compatible with WooCommerce. You can also use the portfolio options to show your artistic food. The theme comes with lots of customization options to make it look the way you want. You can style your content using the shortcodes. 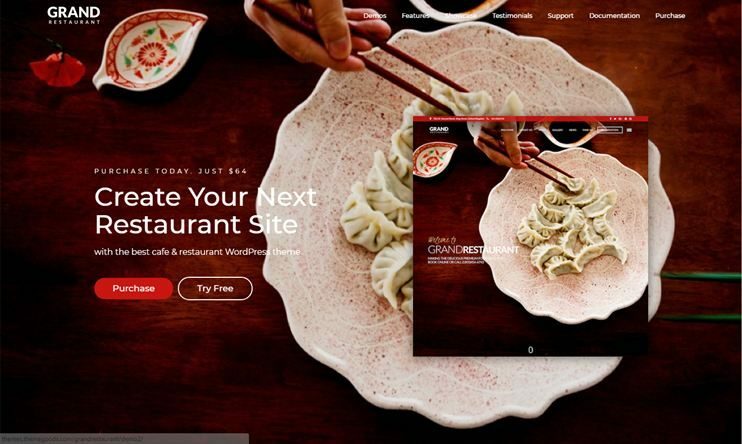 Umami is one of the best WordPress restaurant themes. It comes with abundant options and easy customization options. Set full screen image for the homepage slider and add call to action there. The theme allows WooCommerce integration for the ecommerce features in the website. It comes with lots of customization options. Umami has the option to let you display your staff members easily. With Umami it is possible to set unique background to each post and page. The spot is from the theme of the crop. It is stylish, feature packed and easy to use. 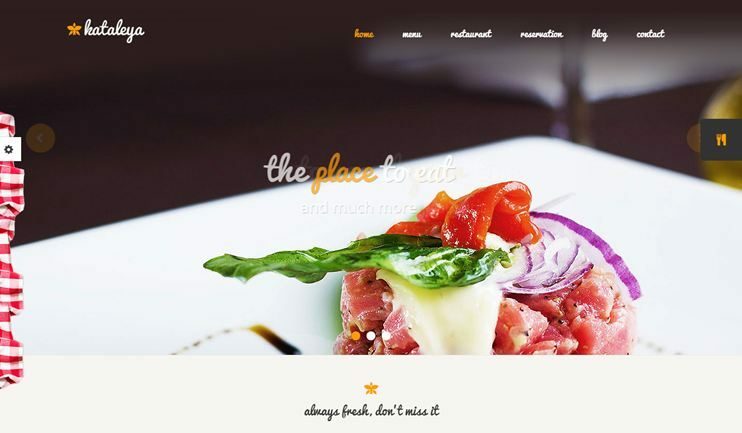 With this theme, you can create a restaurant website of any kind. The spot is occupied with a full screen image slider and call to action region. The theme allows you to create a restaurant menu very conveniently. The spot comes with inbuilt reservation management features. The theme is SEO optimized too. It also comes with integrated google maps. You can use this theme to create a website for restaurant or cafes. 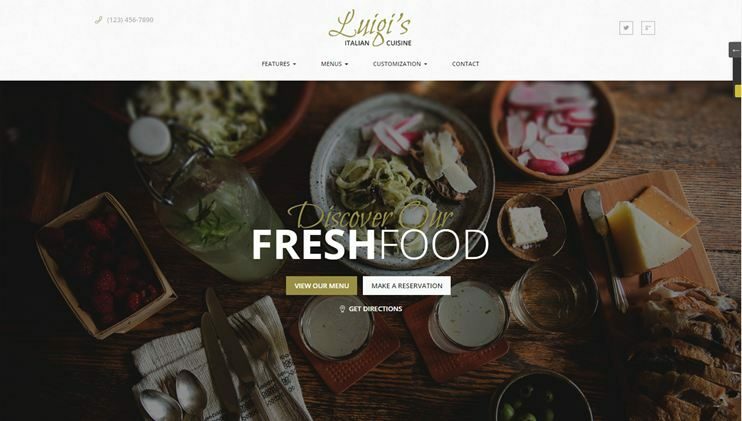 Luigi is a WordPress Restaurant theme for creating website for italian bistros. Besides, it can also be used to create a website for any kind of related to food industry. Luigi comes with a unique homepage editor to let you recreate the homepage. With this theme you can create and display events on an events calendar. The theme comes with Online reservation systems. The theme is SEO optimized. 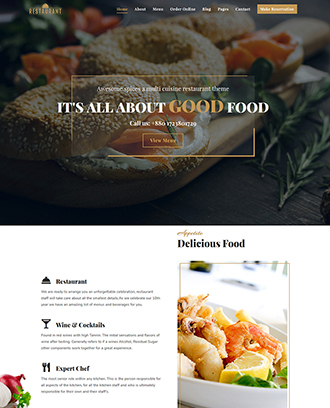 ItalianFood is one of the best WordPress One Page theme that contains many effective components representing your restaurant business very attractively and effectively. It allows you to create beautiful and unique layouts visually, without touching a single line of code. Theme has Full-width slider on the homepage where you can portray your restaurant services. Push panel in the menu, which shows all the menus of your website on the left-hand site on the home page. And when it is closed, your slider becomes fullwidth. It has blog post formats. Theme also leads with features like RTL compatibility, testimonial section, Inbuilt contact form along with google map integration, Parallax effect and there is also a video embedded region which lets you import or upload tutorials. 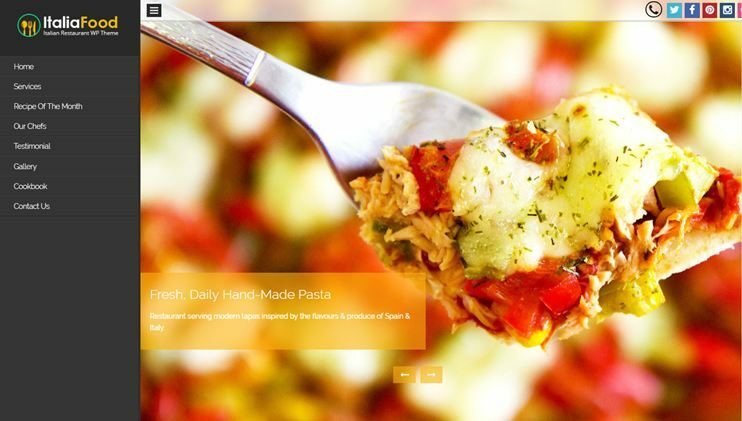 Delicio is a WordPress theme for restaurants and cafe. 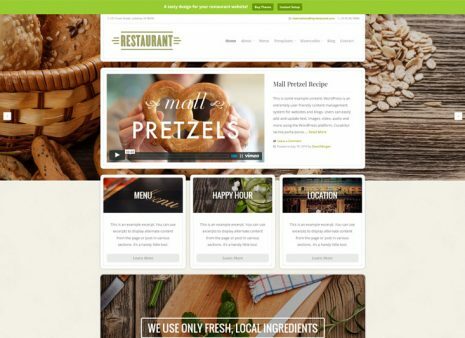 You can use the theme to create a website for your restaurant or cafeteria. With the theme options, you can easily customize your website. Change how your website looks with the visual customizer. The theme allows integration of WooCommerce for ecommerce features. You can create beautiful menus with the theme. The reservation features of the theme can be availed by the restaurant reservations plugins. With the inbuilt drag and drop page builder, you can create pages of your website. The theme is SEO friendly. 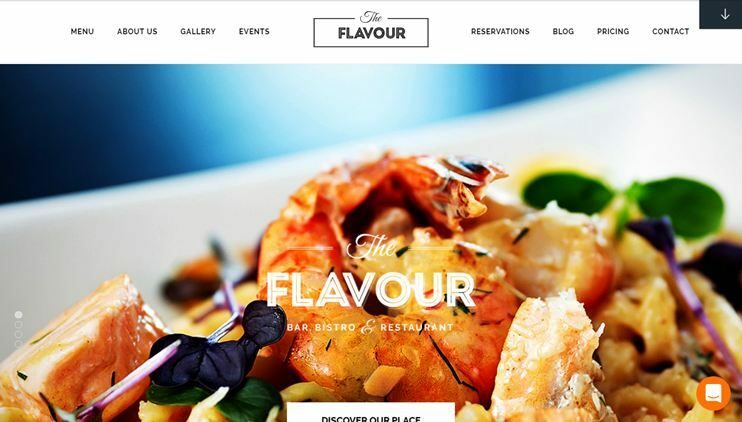 The Flavor is one of the best WordPress restaurant themes. It has unlimited customization options and utility oriented features. With the theme options, you can manage how the theme behaves. It also allows to add the events and show them using the calendar. The theme comes with an admin panel of unyson framework. The Flavor comes with restaurant specific icons. With the visual page builder, you can create pages with drag and drop. The theme is SEO optimized too. The theme comes with automatic backup options. Downtown is one of the amazing and best WordPress restaurant themes. It has an elegant design and is highly customizable. The theme is perfect for blog, recipe, cuisine, bar and restaurants. Beside, it can be used for any purpose. The theme comes with revolution slider included. You can set custom background for your website. It has integrated share feature. You also have some custom widgets. You can style your content with the available shortcodes. The theme comes with a working Ajax contact form. It also comes with google maps integrated. The theme of the code is clean and well commented. Cafe Pro is a theme for cafeteria or food courts. It lets you create any kind of food related website. With the abundant theme option you can change the settings for your website. With the widgets you can show the relevant information at desired place. It also comes with a landing page template. The theme comes with multiple page templates that you can use directly for your website. 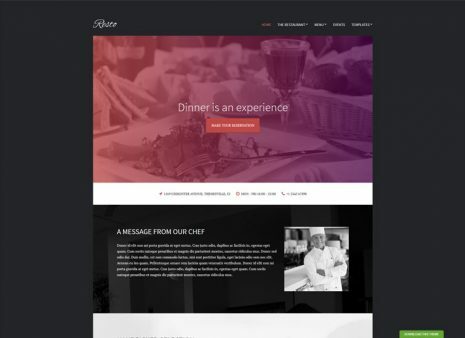 Resto is one of the best WordPress Restaurant themes. It can be used to create a restaurant website or any kind of the food related website. The homepage can be redesigned using the drag and drop options. The theme comes with a complete event management system. The theme is SEO optimized. You have custom widgets that you can use to increase the functionality of the website. Resto is completely speed optimized. With the advanced theme options, you can change the settings for your website easily. Plate up is a modern restaurant WordPress theme. It is one of the amazing cuisine themes that can be used for any kind of food related website. The theme is logically designed. It focuses on your business. The theme comes with easy options to let you create amazing menus. 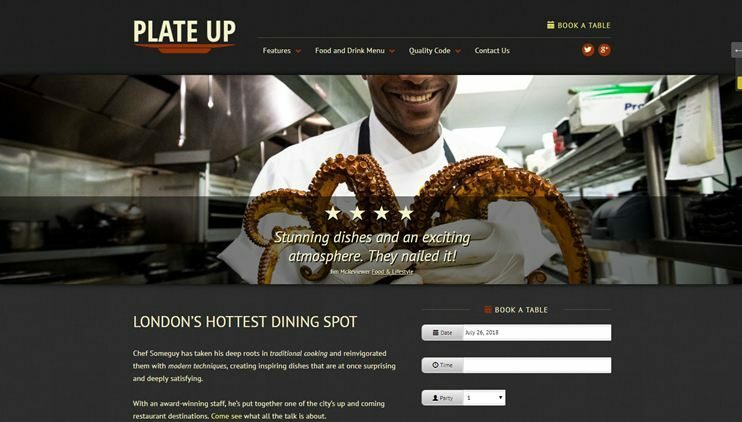 Plate up has a features for online reservations. The theme has google maps included. It is SEO optimized. The theme comes with contact form. 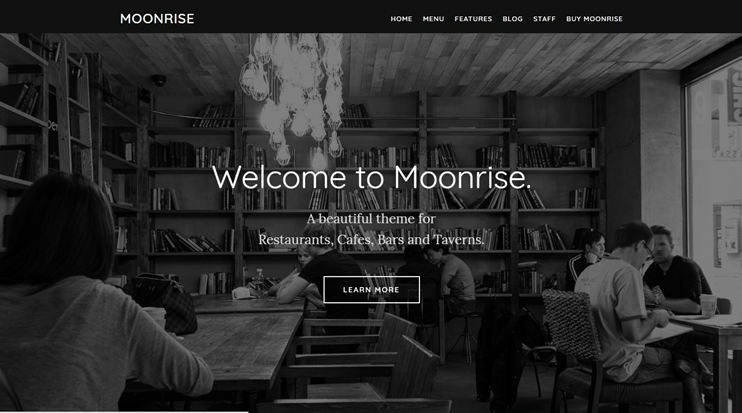 Moonrise is an excellent theme for creating a restaurant or food related website. 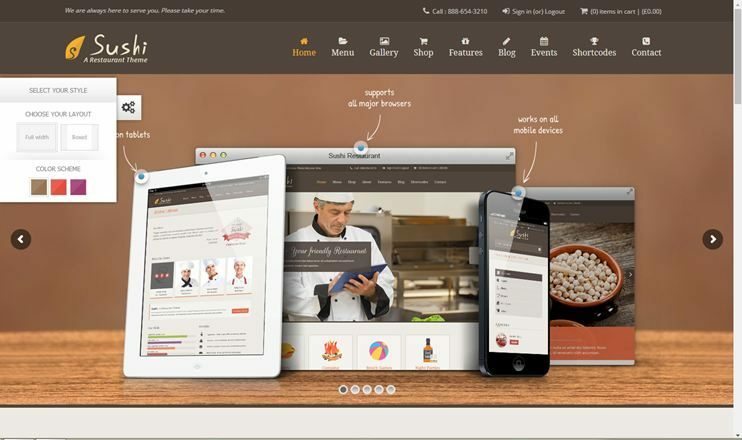 It has all the features to let you create an amazing restaurant website. The homepage is elegant and feature rich. You can create food menus for the restaurant. Moonrise has amazing customization options. You can change colors of the theme, google fonts, and pre designed skins. The theme comes with social media integrated. It also has a staff section to display your staff on the website. Igloo is a beautiful theme from cssignitor. The theme is designed for bars and restaurants. 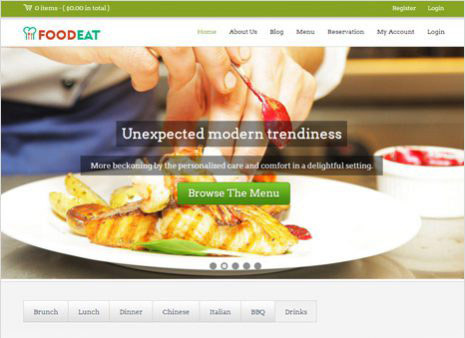 With this theme, you can easily create a website for restaurant or any food related website. The theme has unique layout options. It comes with useful content types. Igloo lets you create food menus very easily. The theme comes with custom widgets to present content. The theme has multiple color schemes. With the powerful theme options, you can change the theme settings easily. The theme is speed and SEO optimized. 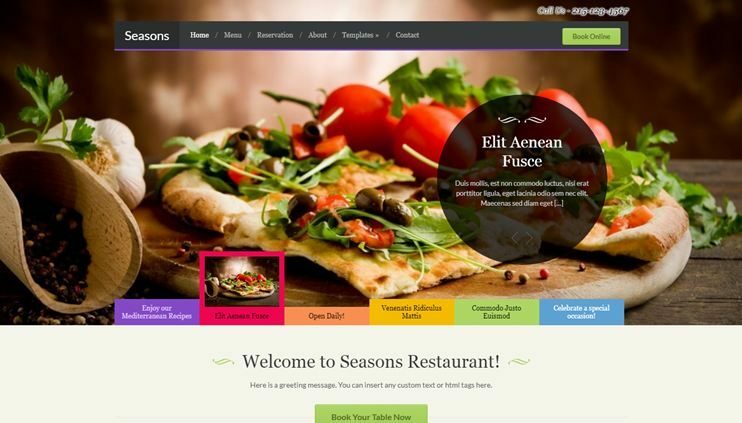 Seasons is a restaurant WordPress theme from WPZoom. The theme is ideal for creating any food related website. With the advance theme options, you can customize the theme and make it work the way you want. To display your images, you can create a slideshow. Seasons come with food menu template to let you create menu for your restaurant. Use the Gravity forms to create reservation forms for your website. To post recipes or news regarding your restaurant, you can use the beautiful blog options. Seasons is SEO friendly and highly customizable. Foxy is a stylish WordPress restaurant theme. It is highly customizable and full of features to let you create an amazing WordPress website. The theme comes with animated page loading effects. Foxy has the facility to show staff, food menu and your services. You can use the WooCommerce and JigoShop for ecommerce features. It is Social media ready. The theme shows images using beautiful light box. FoodEat multipurpose elegant WordPress Theme has flexibility in design and essential functionality through advanced E-commerce plugin – to charm your potential customers. Woocommerce compatible theme is specially designed for online food ordering system. It also offers an automated reservation system, that allows your visitors to make their reservation at any time according to their convenience. Collect advance payment for your pre-booking with PayPal payment system. Other remarkable features are 4 template layouts, add business tagline, 3-column service section, customisable colors and styles. The footer section of the theme is designed with 4 different widget areas where you can add items accordingly. 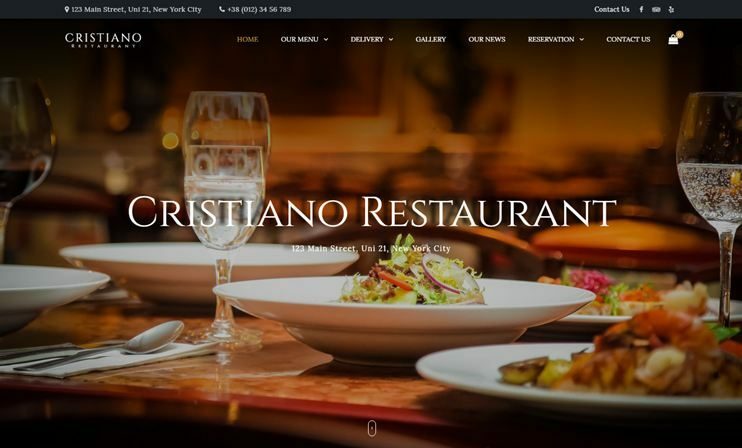 Cristiano Restaurant is restaurant WordPress theme with a clean and elegant design. This theme can be used for restaurants, Cafes, Fast Foods, Pizzerias, bistros, Cafeterias or any such food point. 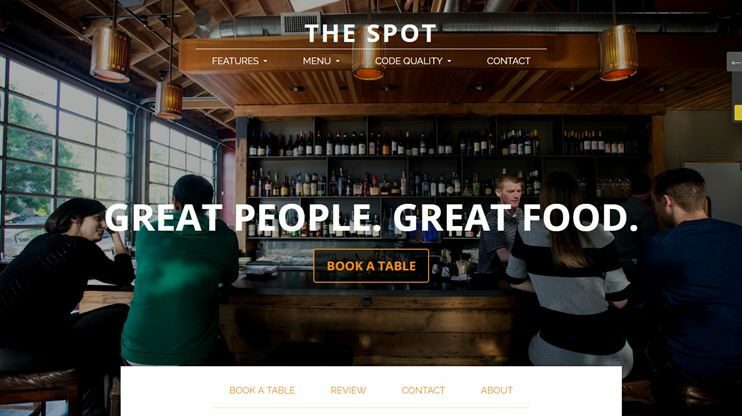 This restaurant theme flaunts a beautiful homepage slider and is fully SEO friendly. On this WordPress theme for restaurant, you can set multiple price variations for menus.This restaurant based theme is SEO friendly and fully responsive. For table booking, the theme includes a reservation system too. 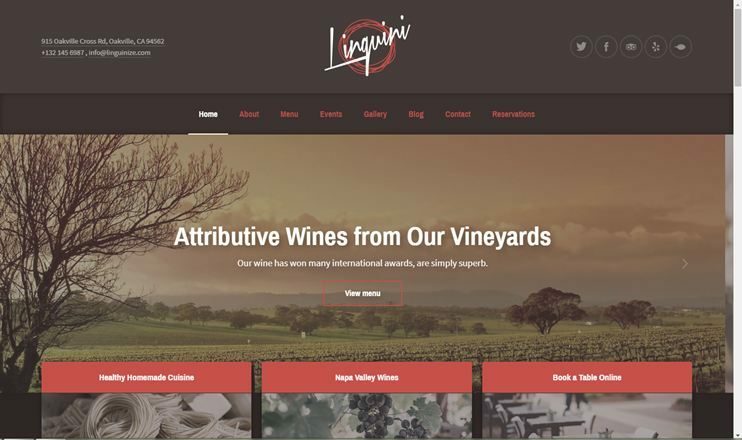 Linguini is a restaurant based WordPress theme which is suitable for any kind and size of the restaurant, cafe, bistro, pub, winery, farm, bar or any other food-related business. The theme is clean and highly optimized and responsive so you can view the site on any mobile device.The theme is easy to install and is easily customizable with more than 800+ google fonts and unlimited color changes that to choose from. The theme is supported by reservation system which can increase the number of diners and accept and manage reservations. This restaurant theme is fully widgetized and includes multiple widgets for homepages, sidebars and footer area. 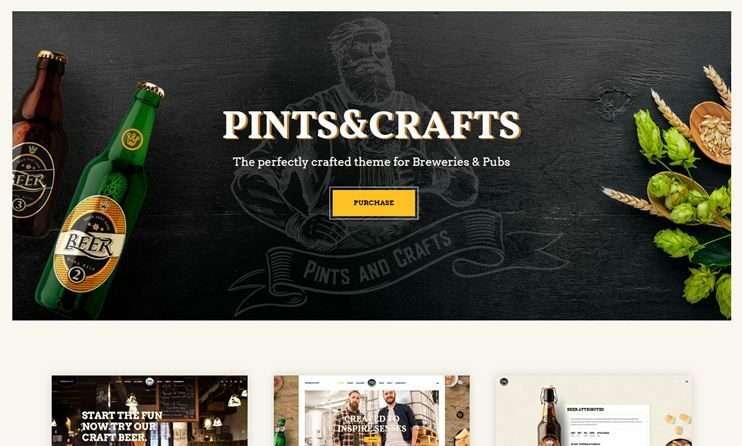 Pints&Crafts is a simple and beautifully designed restaurant theme made for breweries and pubs. The theme includes multiple homepage designs that you can choose from and is fully responsive providing compatibility with Visual Composer and WooCommerce theme. The theme is easy to use with one click demo content and powerful admin interface. The theme has multiple shortcode features which you can use to create a unique and elegant design site which supports Google fonts and with the use of shortcodes, you can create portfolio slider, category and many sliders in a different page. Gastro is a multipurpose cafe and restaurant WordPress theme. It comes with multiple homepage layouts and elegant design. Choose the page design you like and customize it to make the site more beautiful and creative. The restaurant WordPress theme has Online Booking features. You can even take the orders. Display menus and use the pre-designed booking for to accept reservations. The theme is cleanly coded and fully responsive providing compatibility with WooCommerce plugin. 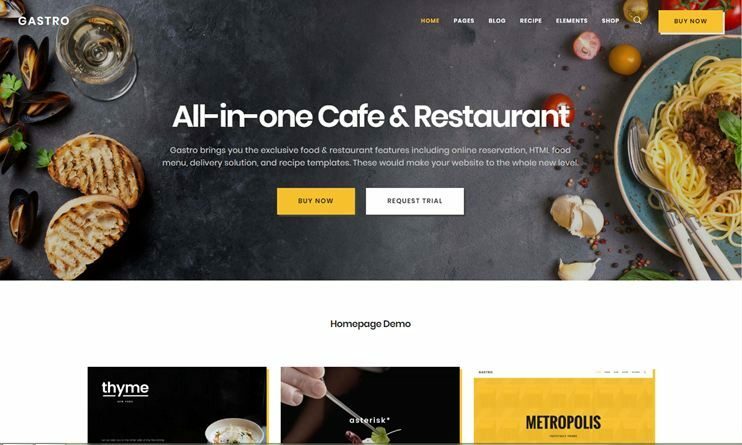 Gastro restaurant theme is compatible with premium plugins like WPML, Slider Revolution, Yoast SEO, Mailchimp and Many more. You can share your recipes online to any other users as well. 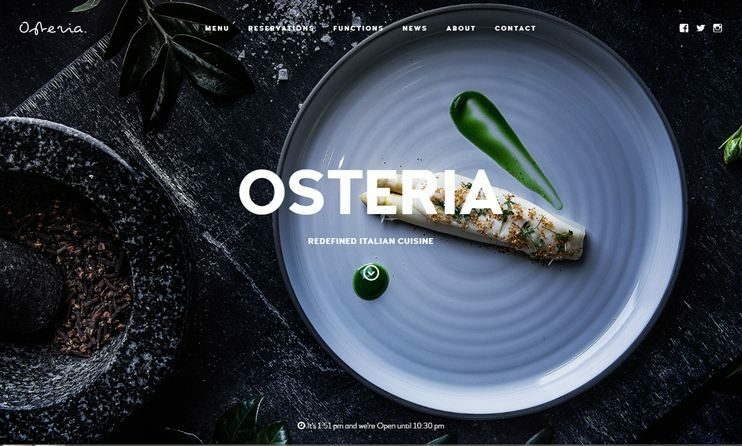 Osteria is a powerful restaurant WordPress theme. This restaurant theme has a dynamic parallax and fully responsive design. The theme has an optimized and clean code. Moreover, it is an SEO friendly WordPress restaurant theme. It comes with an inbuilt feature to add food menus on your website. You can allow online reservations on your restaurant site. The theme also offers private events that you can host for specific dates. 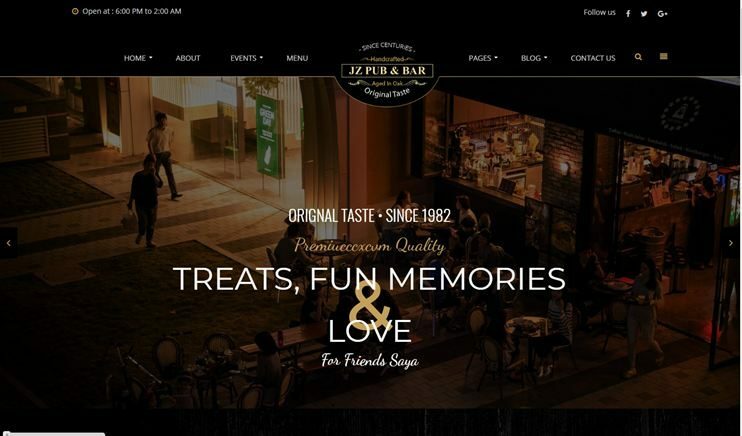 Even though this is a pub and bar theme, you can easily use it for your restaurant website building. This WordPress theme is specially made for restaurants, pubs, brewery, tavern and bars also for winery and shops. This restaurant based theme is compatible with WooCommerce and the Visual Composer plugin. So you have all the eCommerce features and can create and edit page with the drag and drop page builder. You can easily customize your website using multiple page layouts and designs. 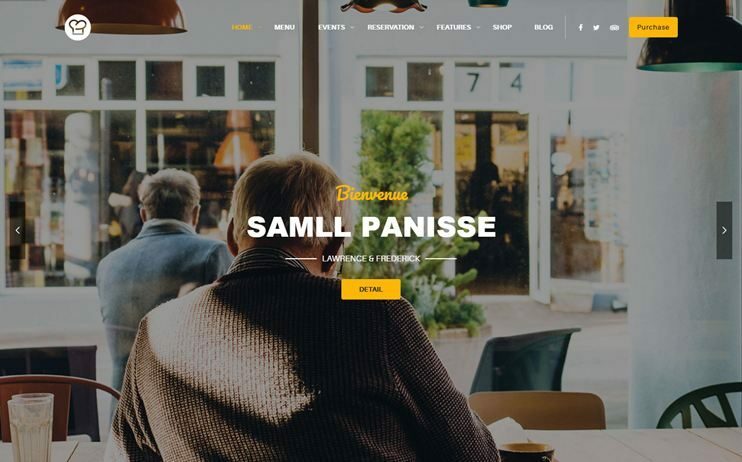 Butter is easy to use restaurant WordPress theme. It works best for restaurants, pizza huts, bakeries or coffee shops. The theme includes multiple homepages and single page layouts that you can choose from. These page templates are customizable to let you adjust your website’s appearance and page structure. Compatibility with the Visual composer helps you to easily customize your site with no coding experience needed. 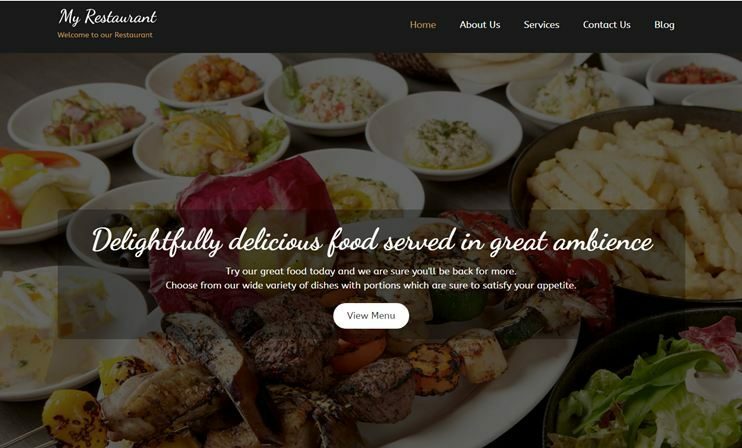 The Butter restaurant theme is also compatible with WPML for creating a multilingual WordPress restaurant website. It would be really tiring and time consuming to visit different websites and find a suitable restaurant theme. But you won't have to do that. We will keep updating the theme to ensure that you get the modern and most efficient theme. Because a great restaurant deserves an equally great online presence. And these themes are best of their kind. They're packed with every feature a restaurant website will possibly need. So, you can choose your favourite theme and create a website on your own.